Study4Success is a scholarship set up by Optivo to promote and support education and training. Echoing Optivo's values of social impact, we recognise that your actions within your local community have a positive benefit for all. Optivo has partnered with Middlesex University to offer one successful applicant who has made a difference to society, the opportunity to have their accommodation fees paid for one academic year (40 weeks) at Usher Hall, a Middlesex University hall of residence. The successful student will receive academic year hall costs towards accommodation in Usher Hall, which will be paid directly towards the student's accommodation fees. 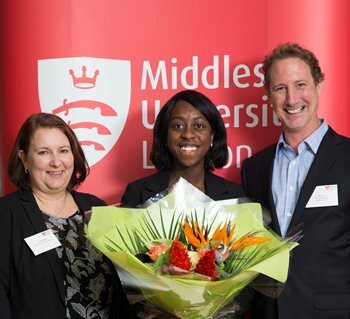 The award is open to any Optivo resident who has been offered a place on a first year degree course at Middlesex University starting in September 2018. Applications to attend Middlesex University open in March 2018. You can demonstrate in a personal statement of no more than 500 words, how you have a made a positive social impact on your community and made a difference to society. Morella Francis – Optivo Study4Success Award Winner: When asked about the difference that this award will make to her studies, Morella said "I have got enough money to buy the equipment for my course and to go abroad on trips for fashion and design. I want to be a designer, but mainly a tailor, so I definitely need all the equipment for that." In no more than 500 words, tell us about yourself, how you have made a difference to society, why you have chosen to study at Middlesex University, and why you merit an award. Please observe the maximum word limit. Please check that you have provided all of the above before sending your application. For further details, please email the Middlesex University Development Office or call +44 (0) 20 8411 4389. For more information on the application process, please e-mail Mile Elsden or call +44 (0)7595 550 986. Applications must be received by 5:00pm on August 28 2018. The scholarship is open to any Optivo resident who has an offer to start the first year of a degree course at Middlesex University in September 2018. The scholarship will take the form of fee-waiver applied against the accommodation costs for a 40-week contract at Usher Hall for the academic year to which the award applies. The scholarship is worth £6,092.80 for the academic year 2017-18. Optivo reserves the right to change these terms and conditions including the application criteria without notice. To speed up the application process and to enable us to inform the successful applicant, please check that you have provided all required documentation, as listed above.